Kids can travel in comfort with the Nania Imax Premium Group 1-2-3 Car Seat. This ultra-padded forward-facing car seat is designed to keep your little ones cosy on your journeys together. Suitable from 9 to 36kg (approx. 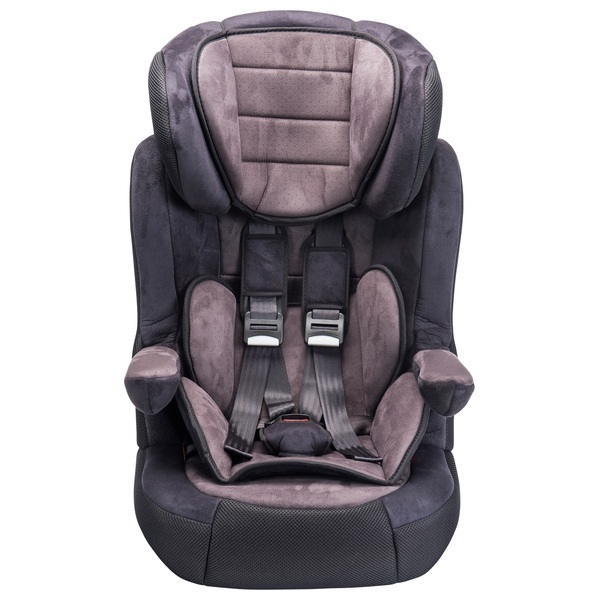 9 months to 11 years), the Nania Imax Premium Group 1-2-3 Car Seat has adjustable padded armrests to maximise comfort, and super soft suede fabric for a luxe finish. This cosy car seat reclines to accommodate naps on long journeys and has a height adjustable headrest designed to grow with your little one. The Nania Imax Premium Group 1-2-3 Car Seat is padded to perfection, with side impact protection to guard your child’s head and neck from harm in the event of a side collision. The 5-point safety harness keeps their hips securely centred and has padded shoulder straps for comfort. The Nania Imax Premium Group 1-2-3 Car Seat is an exceptionally comfortable car seat, offering cosy trips for years to come. The seat liner is removable, so you can easily hand wash thesoft suede fabric whenever it needs to be freshened up. Easy to install and easy to use, the Nania Imax Premium is the perfect Group 1-2-3 car seat for growing kids. EU Warning: Maximum weight is 36kg. Always remove car head rest when fitting car seat.